My mother collected dead insects, interesting rocks, dried plant parts, fallen birds’ nests, discarded bird eggs, and other things from nature, mostly because she was an artist and a teacher, but also because of her insatiable eye for beautiful things that are missed if one walks too fast. Her kids and grandkids always loved to look through her treasures. Years later when she died, there were all kinds of little surprises tucked away in little boxes, drawers, and corners of shelves in her art room. There was always something rooting in a glass of water on a window sill or shelf. Mama never met a house plant or flower she didn’t want to take home. Those traits have been duly handed down through the family. One of my own grandsons, who is now married, mailed me the discarded skin from his pet snake when he was about 8 years old. He knew I would love having it in my nature collection. He had already been with me on many hikes in the woods, where we would slow down to pick up all kinds of interesting things. He knew my mother too, but only too briefly. But he knew her well enough to know that she loved the same things. In my move to this new home, I made sure that I kept that snakeskin in its original envelope. 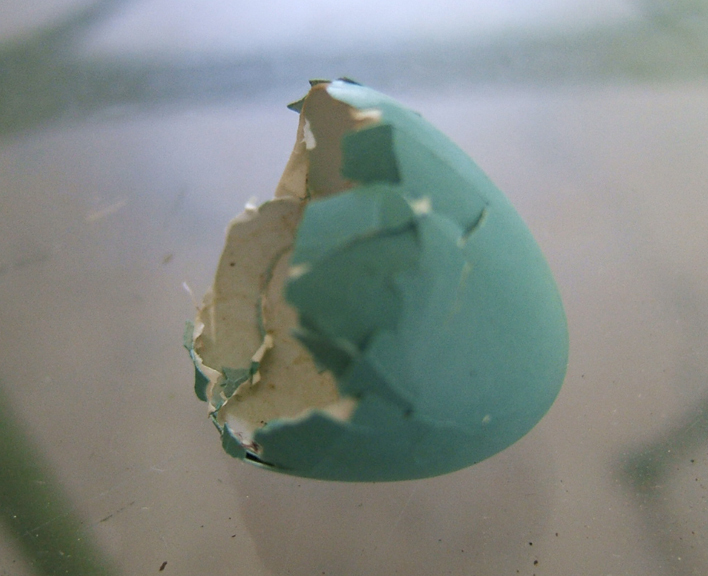 A tiny blue shell of a bird’s egg that I found out in the yard right by the garden about three weeks ago. That little eggshell has been in my kitchen window sill since I brought it inside. This tiny egg is no more than 3/4″ in diameter. Both halves were nested together. I’m told that chickadee eggs are blue. I wouldn’t think it’s a robin, because those are bigger. It might have even come from our little birdhouse where the chickadees nested this spring. 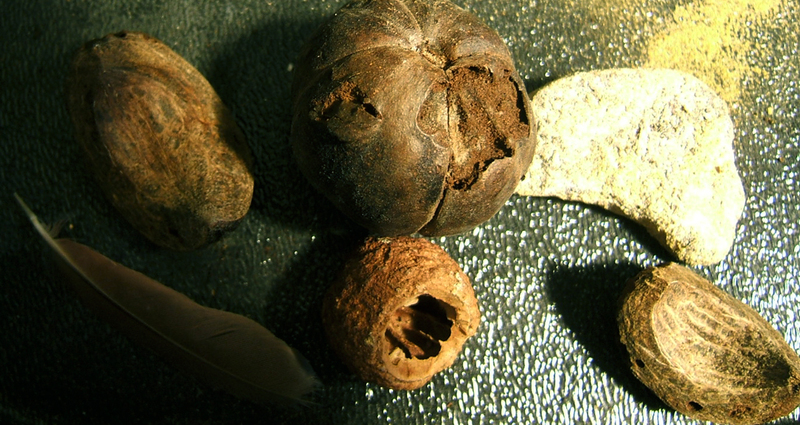 Then on the same little table where I keep all my painter’s tape and staple guns is a growing collection of just “things” — including a decaying hickory nut, half of a hickory nut shell, another shell that had been gnawed into by some rodent, a tiny orange feather, and two small rocks. And — well — there’s the small matter of plants. I found this avocado pit tumbling out of the compost pile when I was stirring it, and it had taken root. I picked it up because it looked so beautiful with just a little shoot at the top and a couple of roots at the other end, with all its decay marks on the surface. My original intention was to draw it. But of course I couldn’t leave it to die. After all, it had a tree inside it. So I stuck it in water, supported with toothpicks, and look at it now. I still feel moved to draw it. Maybe I will. The sad thing is that to survive it will have to live inside for the winter. I suppose that’s always possible to do. More and more it’s looking like home around here. Note: Yes, you do see the avocado tree sitting on top of a stack of new panels that are ready to go. I see paint in my future! Do you collect little treasures for inspiration? If so, what catches your eye in your everyday travels? Pine cones – especially tiny little ones, and interesting leaves and unusual stones. I adore them! Thanks for the link to the Islamic patterns in your previous post – it’s a gorgeous site. Hi Angela. Thanks for commenting. Yes, aren’t pine cones wonderful? And interesting leaves and unusual stones. Went to your blog and see it’s temporarily closed. Let us know when you’re back up and running! My husband laughs because I always have full pockets and our house looks like a naturalist display. I have nests, eggs, skulls, rocks, feathers, snake skins, shells, etc. Your treasures are enchanting, Martha! I wish I had room to collect things like this, but if I did, the only available space is behind closed doors, where I’d forget I had them. 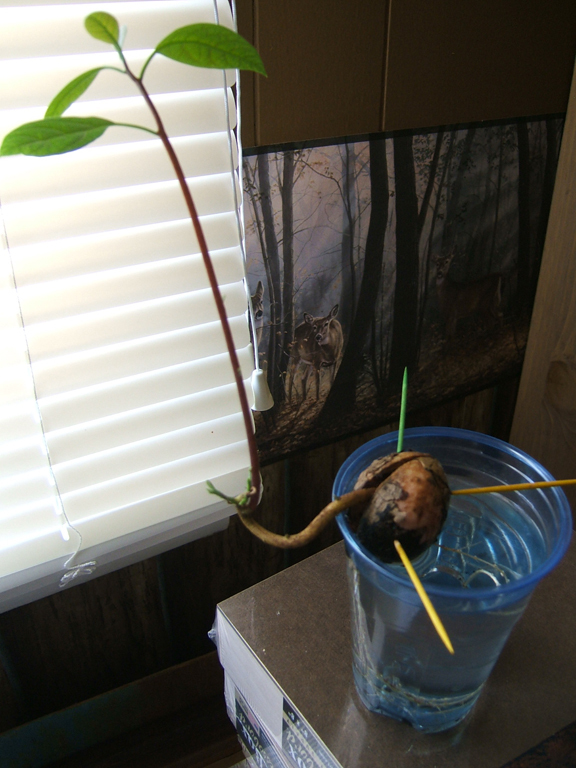 Go, little avocado tree, go! Judi, maybe lack of space is a blessing and not a curse. We don’t have all that much space either, really. My studio is filling up fast, as I knew it would! I seem to think just like you, that all these things are treasures. I am sitting here at my writing table to the the left of me, neatly displayed on a bench, are all different sorts of rocks, some rooting Jade plant that I “borrowed” from a house at the ocean, two piece of wood that need to belong with each other, and a plate-full of five blue ceramic heads. Isn’t it wonderful?? I love that we all love these things. Have you seen the book ETC? Wonderful. I purchased it at Anthropology after a referral by Donna Watson of Layers. Teri, I haven’t seen that book. I will definitely look for it! I’ve been reading your blog this morning and can see the similarities in philosophy. Unfortunately, I never got my wish to live off the land. I love that you enjoy simple treasures too. I believe they keep us grounded. Martha, I swear we are sisters…, and this blog proves it beyond a doubt. My mother was the same….and I am too…the things i find outdoors, just pile up in weird places…I try to resist bringing in seashells, interesting nuts and seeds, skeletons of dried up lizards but somehow I can’t. I have skulls of deer found up in Pine Mt., rocks and pine cones on the window sill…I have to pull weeds and I had to buy a gourd on my way home that is now home to a dear wren, whose children will probably be eaten by the cats or dogs….but it is truly a compulsion to be connected to the natural world! and a healthy one I think. I will miss the citrus when we move…but FL is not so far and I will get my avacados (I have a friend in Michigan who nourishes one indoors) and grapefruit and tangerines…Thank you for sharing that…I am not alone……..I think I have many sisters…like you! Toni, we just didn’t get enough time to hang out more before I moved. And the times we did spend together were talking about art, art, art! But the rest of it — the collecting, the connection to the natural world, the special eye for the amazing small nature creations all around us — maybe we really are sisters. I do think this way of looking at the world is genetic. Not everyone in my family has these same traits. And in my family it seems to go along with the art trait. It’s wonderful that your children and grandchildren will carry on the family tradition of loving the wonder of all that is around us. So very important! DJ, imagine my joy when I learned this same grandson mentioned in my post is an organic gardener now! !